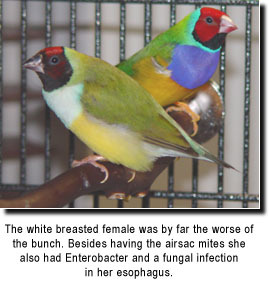 ladygouldianfinch.com - Avian Supplements Tested: Surprising results. One of the largest mistakes that I made was agreeing to forward a check for payment on two pairs in advance of an on-site inspection. This particular breeder had received $250.00 for each pair and had already cashed the check. What I found was a carport attached to a mobile home that had been poorly converted into a bird room. The atmosphere wreaked of mold and mildew. I found approximately 20 12" length x 12" high x 8" wide cages with nest boxes in each cage. 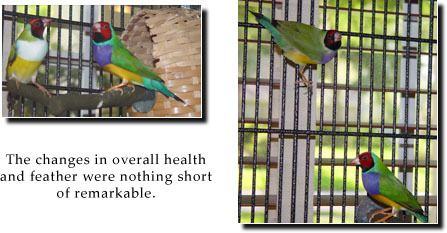 To one side of the room was a small flight cage with a handful of Gouldian youngsters in it. There were also approximately 10 pair of Bengalese finches. At least one week passed and the condition of the Goulds continued to deteriorate. Luckily, I had 24 hr access to a Diplomat of Avian Medicine who I worked with for years, within 60 miles of my home. I took both pair of Goulds to her late on a Sunday afternoon. The condition of both pairs had deteriorated to the point that their small cages were quickly placed in a temperature controlled incubator that also had oxygen feed attached. We began an aggressive oral treatment of Ivermectin to treat the air sac mites. We did not honestly expect either pair to "make it" as the daily handling of the Goulds would no doubt add to their already taxed immune systems. Further test results indicated that the pairs also had a concomitant yeast infection as well as Enterobacter bacteria. The odds were not looking good as two additional medications would be necessary to properly address all of the issues. Clearly, these Goulds were literally on their last legs, panting for air, reticent to eat. Almost 14 days later, the veterinarian called. All the birds had weathered the storm and had resumed eating activities. Further testing revealed that all original health problems were resolved. My wife and I felt blessed. During the time of our Gould's hospitalization, we were busy arranging for new housing here at home. Each pair currently resides in a cage that is 4' wide, 2' deep, and about 30" high. The cages were placed in an eastern exposure area, a quiet part of our home. 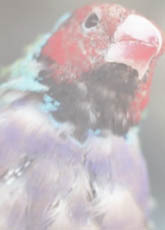 We had upgraded their finch mix and ordered Dr Marshall’s vitamin & mineral supplements, Ioford and Dufoplus. We found that the cost of treating a sick bird can be very expensive. The costs to treat our four exceeded $600.00. However, our desire to provide the best care available to attempt to save them from imminent death has been returned 1000 fold. Our Gouldians are now provided with fresh water twice daily, disinfecting the water feeders each time using Dr. Marshall's sanitizing powder. Fresh greens and veggies (grasses, sprouted seeds etc) are provided early each morning. Around 2:00 pm fresh soft foods and various fresh fruits are provided as an afternoon treat in addition to their staple seed mix. It is a routine that has become a pleasure not a chore. Cages and perches are sanitized at LEAST once weekly. The results of good hygiene have resulted in gorgeous plumage, vibrant color, and a whole lot of noise and activity throughout the day. My wife and I have always believed that we are stewards of the animals that share our lives, and no expense is too small to ensure the comfort and health of our birds. 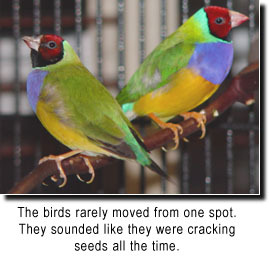 I urge Gouldian lovers everywhere to stop and remember what precious little gems these finches are. 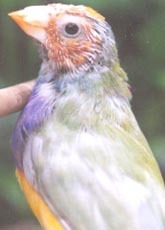 That combined with the fact that the Gouldians in the wild population continue to decrease should encourage one to do all that is within his/her means to extend the utmost courtesy and respect toward these beautiful animals. down a path of truth and love.